Running numbers: 6800 - 6879. The 'Grange' class of locomotives were the 5 feet 8 inch 4-6-0's outlined as long ago as 1901 by Churchward's Standardisation Plan and for so long advocated by the Running Department until the advent of the 'Hall' class. The 'Granges' were intended to replace the 300 strong class of 43xx 2-6-0 locomotives using their wheels and motion onto the new engines, but only eighty had been built when war interrupted the programme and it was never revived. The class was a smaller-wheeled version of the 'Hall' class with the platform raised over the cylinders. The first three members of the class were fitted with cast iron chimneys until a new, smaller chimney was designed, appropriately called the 'Grange' type. Wheelsets for the first batch of thirty 'Granges' came from a pool of reconditioned parts obtained from engine numbers 4300/1/4/5/6/8-11/13-15/17/23/24/27-34/36/38-41/44-48/50/51. The power classification of the 'Grange' class was 5-MT, the G.W.R. power class was D and the route availability was RED. 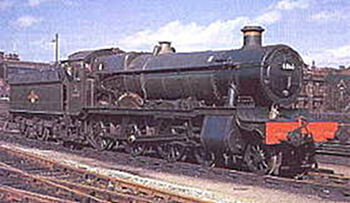 One member of the class, 6851 Hurst Grange, was fitted with a 3 row superheater. No members of the 'Grange' class were saved for preservation.